Canadian Housing Market Headed for Soft Landing? The Conference Board of Canada came up with a new report which proclaims that all the data points to a soft landing for the Canadian housing market. 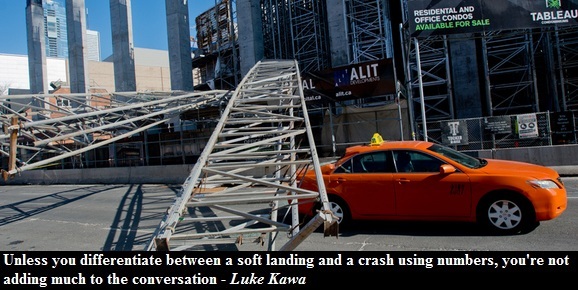 Yet the report fails to define what exactly a soft landing is. Does it mean that prices are going to stagnate or fall by 5-10%? Moreover it seems that all the data that points to a soft landing was cherry picked. Arguably the most important piece of data suggests that there is no soft landing (prices falling 5-10%) in the cards. 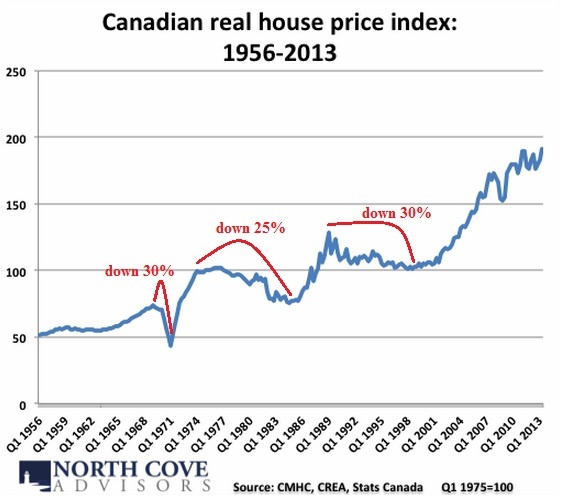 There was never a soft landing in the history of the Canadian housing market. Each time prices went up, they came down by at least 25%. What makes things even worse this time is that the housing bubble is truly national. Previous bubbles were mostly local and as a result the aggregate national index was level. For instance during late '80s there was an enormous housing bubble in SW Ontario but not in the Prairies. While real home prices dropped over 40% in the GTA, property prices remained flat in the prairies. Judging from the above graph, it looks like there was a national housing crash in late '60s and early '70s. I call it a crash because prices went down quite rapidly. The two other instances look more like national property busts as home prices took about a decade to bottom. But again, much of the real events are masked in the picture above due to regional differences. Since real estate prices increased in tandem across the country it is possible that Canada might experience a housing crash on a national level. The more likely scenario is a housing bust which would take a decade to play out. Under a bust scenario there might be some big winners and big losers.